Quite a different read to most other post-apocalyptic books. This one's tongue-in-cheek and written with a great deal of wit and topical observation. The story's told from the viewpoint of semi-immune protagonist Buck as he leaves his home in search of other survivors. On his way he encounters adversaries in the semblance of Klingons and a bunch of kids who wouldn't look out of place on the set of a Mad Max movie. Be prepared to have plenty of laughs as Buck writes about his experiences in his journal. The majority of in-jokes and narrative relate to British popular culture, so non-Brits should be aware they may have a tough time understanding the humour. 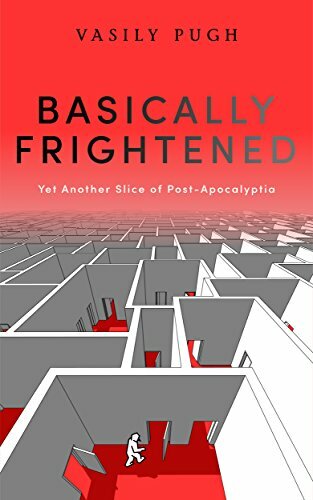 Overall, I thought Basically Frightened was a good read. It approached the post-apocalyptic genre from a different angle which I found to be refreshing. I should also point out that the Kindle version contains quite a few grammatical errors and could benefit from another proofreading. My thanks to author Vasily Pugh for providing a copy of this book.